I'm sure every new city is difficult to navigate with a dog. Until you learn where the small, more deserted parks are, the places where other dog-owners congregate, the areas of wasteland where you can let your dog get some exercise and pee without annoying other people, any city is a bit of a challenge. 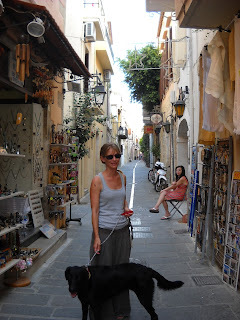 This said, I don't find Rethymno particularly dog-friendly. Especially in summer. 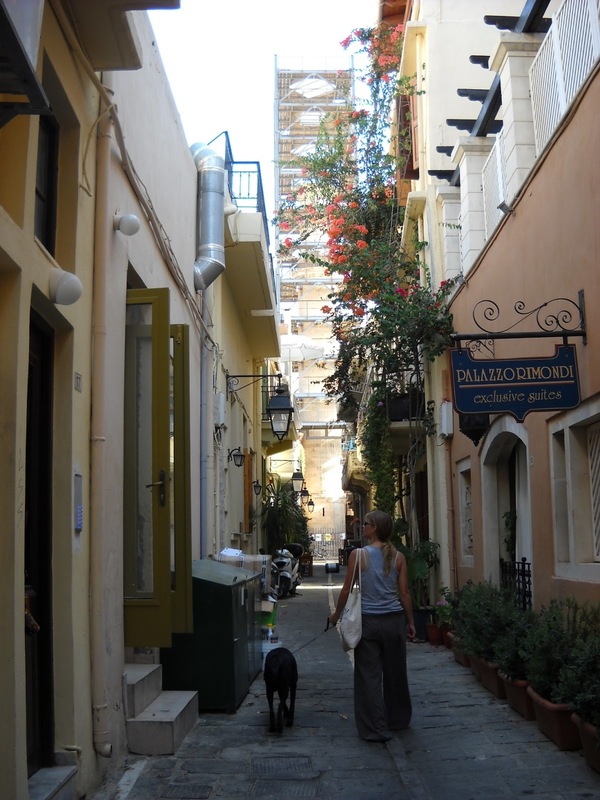 Rethymno is an extremely beautiful town, with small winding streets full of flowers, well-preserved Venetian walls and fortress, stunning architecture, and interesting bars and tavernas. But it seems to me a town for cats. They suit the place, posing prettily in doorways among the flowers, prowling the tavernas hunting for handouts. I like cats. Sage doesn't. Trying to negotiate the narrow streets full of tourists browsing the many jewellery, pottery, leather shops, passing endless nice smelling restaurants, and avoiding cats with a large dog just isn't very relaxing. If you live there, I'm sure life with a dog is easier. 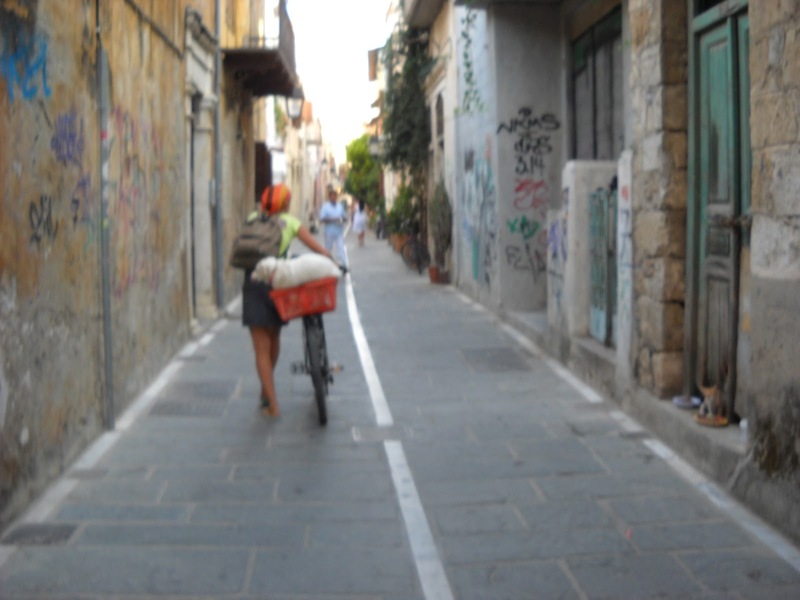 As a tourist, the main attraction is wandering slowly through the streets, stopping to look at interesting houses and shops. It doesn't provide much entertainment for a dog. We did stop there recently, for a drink in one of the bars in the old town, Figaro, and they didn't seem to mind Sage being there. I think another group who were leaving as we arrived had been sitting in the internal courtyard with their dog. 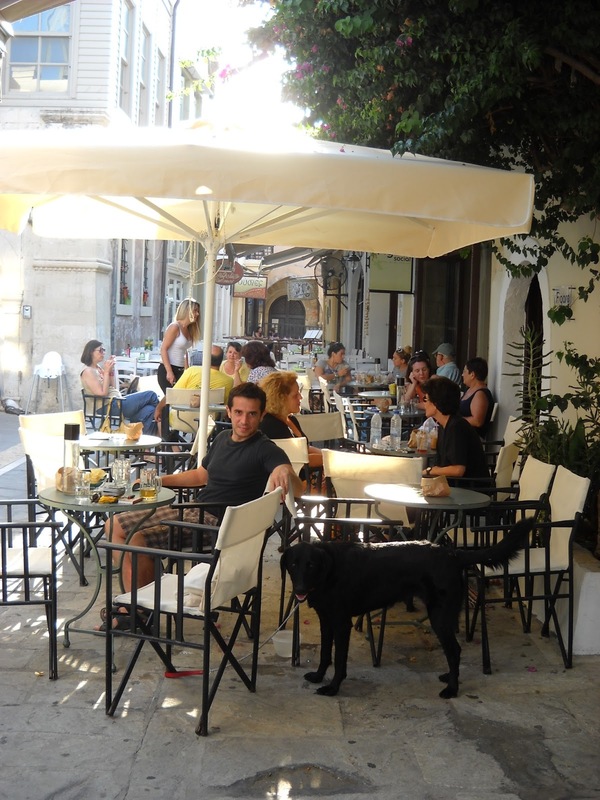 Probably most of the cafes and bars would turn a blind eye if you are outside, and not in the way, with your dog. The few hotels I asked in, in the old town, did not allow dogs in the rooms however. 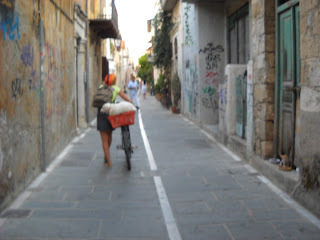 Walking around the outskirts of the old city is great, with some lovely views of the sea, the city walls and fortress. Unfortunately, we tried to do this around 5 in the afternoon, and there was no shade. Trying to get down onto the rocks by the sea was not easy, there were too many people and it seemed by the smell that this area is used as a public toilet. Anyway, we didn't find a good place to let Sage run around. Finally we tried the beach front area. 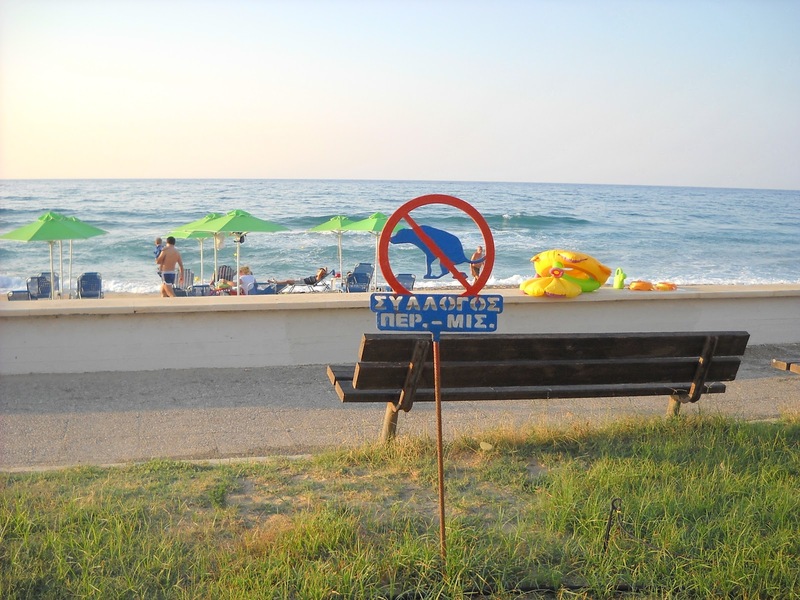 We had been told of a new initiative to prevent dog owners letting their dogs foul along the seafront (first photo). I could see immediately that the beach was far too crowded to accommodate dogs (dogs are forbidden on all busy beaches, especially organised beaches with sun chairs and umbrellas etc). The 'promenade' next to the beach may be nice for a dog walk, although running between the busy beach and the strip of tavernas and bars, it's still pretty crowded in summer.